I’m going to put you at the “steering wheel” of the U.S economy. You will have opportunity to fix the financial mess the U.S. economy is in. Imagine for a moment you are the US Secretary of the Treasury or some all- powerful overseer of US federal government taxation and spending. Which problem should you fix first: (a) national debt; (b) unemployment; (c) taxation; (d) expansion of government benefits to equalize income; (e) provide equal access to medical care for everybody? For reference, you have ~$3.2 trillion in collected taxes to play with and you must make a $523 billion interest payment on ~$16 trillion in loans the U.S. has made (the national debt) and also by law cut $1 trillion of checks for Social Security and another ~$1 trillion for Medicare/Medicaid and then come up with $673 billion for the military, leaving you just ~$4 billion to fund all the other branches of government plus provide food stamps for 37 million people. The U.S. budget is $4.193 trillion and the federal government says it borrows $864 billion to come up with the difference between what it collects in taxes ($3.2 trillion) and its budgetary spending list ($4.193 trillion) – but the U.S. actually spends $6.048 trillion annually (see bottom left corner of the U.S. Debt Clock presented below) and actually just “prints” another ~$2 trillion of electronic money into existence to make up the difference and support the lifestyle Americans have grown accustomed to. Today the public hears various calls for “Medicare for all,” or “guaranteed income” or “tax the rich.” Can a modern society just create endless money into existence, in essence, to give itself a pay increase? Tax the rich: wealthy Americans with over $10-50 million accumulated wealth would pay 2-3% extra tax that would generate $2.75 trillion over a decade, which wouldn’t even come close to balancing the present federal budget. Overtaxing wealthy Americans is already the rule of the day – the top 5% of income earners pay almost 60% of federal taxes; the top 50% pay ~97% of federal income taxes. More worrisome is that public opinion polls show a majority of Americans want these reforms. One pundit cites the fact the U.S. had a 91-92% tax rate on the richest Americans from 1951 to 1963 and the country didn’t go to hell. However, the Baby Boomers were only beginning to graduate from high school then. Medicare was enacted in 1965 and covered 19 million retired citizens, versus 59 million today and another 75 million covered by Medicaid. Retirees received Social Security checks amounting to $14.2 billion (1963) compared to $1 trillion covering 43 million Americans in 2018. Forward projections estimate Social Security will have to cut checks for 79 million Americans by the year 2035. In the early years of Social Security there were surpluses that should have been invested to yield a return when Baby Boomers retired. But those surplus funds were “loaned” to the federal government to finance increased deficit spending. 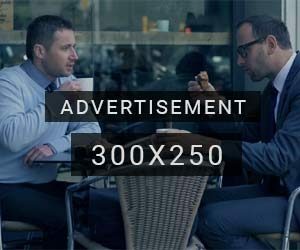 Then there is the reality, that in the midst of a financial mess created by loose lending practices, that the Federal Reserve Bank literally gave “free money” to lenders in the 2008 banking crisis, increasing the money supply by $4 trillion and essentially redistributed wealth in society to the financial classes. We might call it welfare for bankers. So, the government does hand out endless free money, just to a limited group in society. The people at the top and bottom income levels are being propped and a group of 122 million tax payers bear the burden for the remaining 206 million citizens that are stuck in the middle. I’m going to use the U.S. Debt Clock for evaluation purposes as it presents many different economic factors on a single printed page or screen view. You should study the U.S. Debt Clock and become familiar with it. For example, the U.S. Debt Clock notes America lost ~5 million manufacturing jobs in the period 2000-2008 and notes the number of unemployed is more like 12 million rather than the official 6 million. I’ve consulted with the good offices of economist John Williams of ShadowStats.com to guide me through the morass of federal government data, some which is misleading or even fake (examples: target rate of inflation published by the Federal Reserve Bank is ~2%, but actual rate is ~6% higher); the official unemployment rate is ~4% is actually above 20%). If you can’t produce a large enough image of the U.S. Debt Clock re-creation on your computer monitor, then simply go to USDebtClock.org to view real-time data about the U.S. economy. I point to three trigger points that could cause the U.S. economy to crash. Some say the day when consumers lose faith in the U.S. dollar is the day the economy will fail. But in September 15, of 2008 when Lehmann Brothers investment bank fell, the public had faith in the banking system. This means events that precipitated the collapse were being withheld from public view. An investment bank didn’t create a run on the banks because it was for investors not public depositors. The public is not likely to be aware of the dire financial condition of the federal government. Otherwise bank runs might be common. It is more likely that foreign bankers would lose faith in the U.S. dollar and could trigger a collapse of the U.S. economy. When the U.S. needs more money to fund government programs it often borrows that money from foreign countries. This is how the U.S. funds various provisions that exceed what is collected in taxes. It is possible that foreign countries that buy up our debt in exchange for a low rate of interest may not respond to auctions to buy these debt instruments (IOUs). The U.S. Debt Clock says the U.S. needed to borrow $864 billion in 2018. 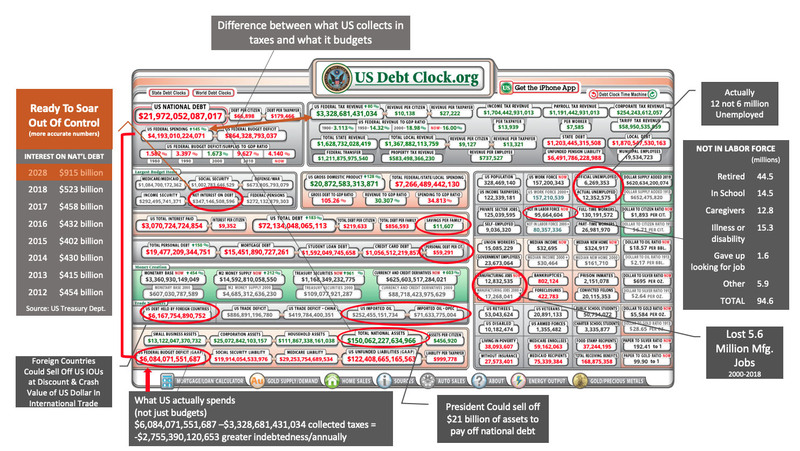 (See the upper left quadrant of the U.S. Debt Clock.). Last November (2018) foreign investors began taking a pass on unprecedented debt securities the U.S. keeps issuing. China is not buying (lending) this debt because of its ongoing trade/currency war with the U.S. Japan is selling U.S. IOUs because of the strong U.S. dollar (only in a relative sense, the EURO and Chinese YUAN are crashing). Then the U.S. has to start searching for U.S. buyers rather than foreign buyers of debt. The interest offered on these U.S. Treasury Notes may need to rise to attract buyers. Record amounts of debt, projected to exceed $1 trillion, are being sold at these debt auctions now. The number of bids received to buy up U.S. Bonds are at an all-time low. Selling off of U.S. Treasury notes (IOUs) at a discount. Looking at the US Debt Clock, you will see $6+ trillion the US owes to foreign countries (lower left quadrant). If those countries feel they will never be paid back, they may elect to sell off their debt notes at a loss (let’s say 30% discount). That would render the U.S. dollar less valuable in international trade. The cost of imported goods would rise commensurately. That type of event would severely affect the U.S. economy. You don’t think this will never happen? China recently threatened to sell off its U.S. debt notes at a loss in its trade war with the U.S.
Interest on national debt exceeds that of Social Security, Medicare, etc. Another trigger point is the interest the U.S. pays on its national debt (upper left quadrant of U.S. Debt Clock). To be accurate, the accumulated debt burden of the U.S. is published at $21+ trillion (upper left quadrant U.S. debt clock). Economist John Williams points us to a more accurate figure directly from the U.S. Treasury Dept. (see below). More accurately the U.S. National Debt, less what it owes to itself, is ~$16 trillion. The U.S. Debt Clock states $347 billion is paid annually in interest on this debt. But the U.S. Treasury Dept. provides more accurate figures I’ve jotted down outside the left border of the Debt Clock. Interest on the national debt exceeds $523 billion and is headed to $915 billion by the year 2028. As interest on the national debt rises, there is less money to pay for other pressing and legally required line items, like Medicare and Social Security that are partially paid for out of the general fund these days. Outside of the FICA payroll deductions that fill the Social Security and Medicare Trust funds every two weeks, there is nothing but IOUs (U.S. Treasury bills) backed by nothing more than the full faith and credit of the United States. So now you understand how precarious the U.S. economy is. It is already overspending and burdened with so much debt that campaigns for a minimum income or Medicare for all seem to be totally out of touch with reality. QUESTION: It seems the Left-Wing Progressives in the US House (opponents of Pelosi) have adopted the Money Market Theory of Prof. Stephanie Kelton of U of MO.-Kansas City to justify unlimited deficit spending of the US Govt. OK as the Govt. can finance its deficits by unlimited currency printing. Would you please comment. — MP. ANSWER: Actually, there would be no issue if the government simply created money to fund its normal expenditure. Historically, that will produce very modest inflation. The crisis is when you borrow to fund that deficit spending. In 2019, interest expenditures may now exceed the cost of defense. It is far cheaper to create the money needed than borrow and keep rolling the deficits forever. Then the cumulative interest keeps rising and crowds out all other expenditures. This is what is happening. The process underway creates DEFLATION, not INFLATION, because the governments keep raising taxes to fund the deficits and that reduces the disposable income. This is why we see riots in France. Yes, people earn more, but they are being left with an eroding disposable income base. Governments need to fund themselves so they raise taxes. But the interest expenditures keep rising and consume all other areas of spending. It becomes a self-defeating process that leads to the crash and burn. The problem is politicians choose to cut bankers into loans to burden the U.S. with unbearable interest payments rather than just printing money directly from the U.S. Treasury Department to meet its obligations. Essentially the federal government “private labels” paper money, being issued as a “Federal Reserve Note” when it is actually printed by the US Treasury Department. The Federal Reserve buys its paper money for the cost of printing (5.5-cents for a $1 bill; 14.2-cents for a $100 bill) and then lends it out to commercial banks + interest. In the 2008 banking/lending crisis, the Federal Reserve added $4 trillion to the U.S. money supply by electronically crediting its member banks by that much (equivalent to printing 40 billion $100 bills). That push-button money cost the Fed nothing to create. Inconceivably, the Federal Reserve now pays banks reverse interest to keep money they were given freely to rebalance their accounting books from being lent out which would increase the money supply with a resultant increase in inflation. Banks were given free money + interest to boot! Americans are never taught where money comes from. The U.S. has a debt-based monetary system. Here is how it works. The U.S. buys cars from Japan. Japan then holds U.S. dollars. The U.S. needs that money back in order to continue to buy cars from Japan, so Japan sends the money back in exchange for an IOU + interest (U.S. Treasury note). So, when you look at a U.S. ten-dollar bill in essence it is a promise to pay Japan $10 + interest. A ten-dollar bill should have a minus sign in front of it. It is debt-based money. Critics say fiat currency isn’t worth the paper it is printed on. It is worse than that, it is a debt in the amount printed on the note. U.S. citizens are buying stuff with IOUs, not real money! This is what President John F. Kennedy said in 1963. If the U.S. keeps dispensing money through a distributor (the Federal Reserve Banks) it would drive the country into insolvency. So, Kennedy signed Executive Order 11110 to strip the Federal Reserve of its power to loan money to the U.S. government at interest, an order that has never been repealed. The U.S. Treasury Department issued U.S. notes in $2 and $5 denominations as “interest-free and debt-free currency backed by silver reserves in the U.S. Treasury.” Around $4 billion of these U.S. Notes were distributed into circulation and quietly withdrawn after Kennedy was assassinated on Nov. 22, 1963. Silver-backed money would have been preferred over the fiat paper money the Federal Reserve distributes. Since 1963 the U.S. would have saved more in interest payments than the entire current accumulated national debt had it heeded Executive order 11110. The President of the United States holds a wild card. The U.S. has physical assets that are valued at $150 trillion (U.S. Debt. Clock, bottom middle) that the General Accounting Office (now called the Government Accountability Office) now says are worth ~$200 trillion. Donald Trump is the first President to say he wants to sell off a portion of those assets and erase the national debt entirely. The U.S. would then become a creditor nation. The bankers would finally be cut out of their scheme to charge the Federal government interest on its own money. Excuse me, I must abruptly cease writing and shop for a bullet-proof vest now. The post Mission Impossible: If You Had All Power and Authority appeared first on LewRockwell.